In Kerala, in the south west of India, there are plans for a private company to build a large new airport, for low cost airlines, at Aranmula. The site is within 100 km of two international airports – at Kochi and Thiruvananthapuram. These airports bring in tourists to Kerala, and it is intended that it brings in pilgrims to a nearby site. The land at Aranmula is greenfield, and there are plans to take at least 350 acres, and perhaps much more for an aerotropolis. Local people fear it could destroy paddy land and damage the region’s water source. They also fear it could harm the town’s ‘heritage’ tag and damage the structure of a temple located just a few hundred metres from the project site. There are concerns that the airport would not be profitable, due to its two neighbours, which are not full. The airport has aroused intense opposition over the past two years, and there have been many protests. The opponents have a Facebook site, and have been feeling they are alone in their fight, being unaware of the extent of other airport opposition elsewhere in the world. 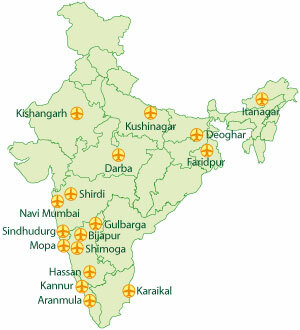 The Indian government recently announced it proposes to build 17 new airports in 11 states. The economic feasibility of the proposed greenfield international airport at Aranmula in Pathanathitta district has come in for sharp scrutiny as it falls within 100 km of the two international airports at Kochi and Thiruvananthapuram and the possibility of the new airport not generating enough business to sustain itself. Rajya Sabha member K. N. Balagopal pointed out that most of the airports in the country, barring a few in the metros and the ones like Kochi and Thiruvananthapuram, were making losses and the proposed one at Aranmula would be no exception. He felt that the project could make profits only through real estate development and not through airport operations. He questioned the claim that the airport could make profit catering to pilgrims to Sabarimala and air travellers to Pathanamthitta. He said operations involving the Boeing kind of aircraft would require over 6,000-foot airstrips, which were clearly ruled out in this case. P.T. Nandakumar, chief executive officer of the KGS Group of Companies in Kerala, which is promoting the airport at an estimated investment of Rs. 2,000 crore, told The Hindu on Thursday that Ernst & Young had done the feasibility report for the project. He did not divulge the details. He said since there was no public investment involved in the project, there was no need to make the details public. The traffic projections and the economic model of the airport had been worked out, he said. However, a senior official of the Airports Authority of India said the Aranmula airport might not be a feasible project to a large extent given the current conditions. The official said the three airports in the State had not reached their saturation levels and air traffic growth in the State was not good enough to warrant another airport now. With little economic activities in the State, the “viability of the project is a distant dream”, he said. He pointed out that better road connectivity could solve the problem for Kerala. The two international airports in the State are located within roughly 100 km of the proposed airport. The State government will have sweat equity of 10 per cent, valued at approximately Rs. 130 crore, in the company promoting the project with a debt-equity ratio of 2:1 (Rs. 1,300 crore of debt and Rs. 700 crore of capital and promoters’ contribution). Details on the KGS group website claimed that the proposed airport would generate 1,500 direct employment and 6,000 indirect employment. The airport project has also been conceived with a view to tapping the pilgrim population of around 60 million (as per 2011 figures) that visit Sabarimala every year as well as the large number of emigrants from the influence area of the proposed airport. Tourism potential in the districts nearest to the site is also expected to attract passengers to fly through the proposed airport. The KGS group claimed that majority of the NRI and NRK passengers from Thiruvananthapuram and Kochi airports originated within 50 km radius of the Aranmula airport site. It said that air traffic in Kerala had multiplied five times over eight years — increasing from two million to 10 million. The promoters of the airport also take heart from the figures for the share of Kerala in the country’s air traffic. Though Kerala has only 2.75 per cent of the Indian population, the international aircraft movement in Kerala is 15.28 per cent of the overall international aircraft movement in the country as in 20112-12. An aviation industry insider said the Aranmula airport promoters had worked out a business model centred on budget travellers. So the cost of building the airport would be less than building an airport for luxury or business travellers. A senior official familiar with airports operations said returns from infrastructure projects like an airport could not be calculated just as it is done in other industries. Infrastructure projects have substantial longevity and returns will depend on the quantum of initial investments yielding profits over a long period of time. The official also said statistics on airports-population ratio in the developed world showed that Kerala could have 10 airports. 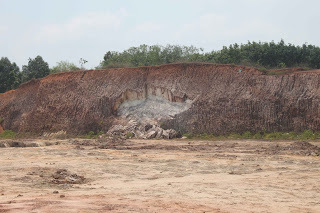 The remaining part of the hill which was bull dozed to fill up the paddy fields and the wetlands. Abraham Kalamannil, a local businessman bought this hill and the adjoining paddy fields and wetlands in 2002. The stated purpose was fish cultivation in the wetlands. But later, he bulldozed these hills and filled up the wetlands and announced his plans to set up an airstrip here, which later morphed into an international airport project. The upcoming KGS Aranmula Airport in Kerala will be India’s first low-cost, private international airport and hopes to attract budget airlines, said Gigi George, one of the three promoters of Aranmula International Airport Ltd which is building the Rs 2,000-crore airport. “We want to be profitable from day one. We do not want to be lavish on having fancy buildings like others,” he told Business Line. “We plan to approach budget airlines such as AirAsia, Tiger Airways, Air Arabia and Air India Express to operate at Aranmula,” he said. These airlines target non-metro destinations. The airport spread over 700 acres is being built in Aranmula, Pathanamthitta district, which is Kerala’s pilgrimage capital. It is located in between Thiruvananthapuram and Kochi international airports. There is a strong opposition to the project among the local people who fear it could destroy paddy land and damage the region’s water source. They also fear it could harm the town’s ‘heritage’ tag and damage the structure of the Parthasarathy temple located just a few hundred metres from the project site. This was, however, refuted by George. Aranmula has been declared as a global heritage village by the UNESCO. The temple town is famous for the Snake Boat Regatta held in the holy river Pampa and for the metallic mirror. While the airport will be ready for commercial operations in a year or two, George said air taxi operations to Sabarimala from Chennai, Bangalore and Hyderabad will commence in December 2013. Sabarimala is an hour’s drive from Aranmula. The airport’s prime land has been levelled up to 12 feet. This should be sufficient for air taxi operations, which is available in places such as Haridwar and Rishikesh. The service will facilitate pilgrims to visit Sabarimala in the morning and return in the evening as a package, he said. Aranmula airport has the location advantage of being close to tourist destinations of Alappuzha backwaters (35 km) and high ranges of Kumily and Thekkady tiger reserve. A majority of non-resident Indians and non-resident Keralite passengers of Thiruvanthapuram and Kochi airports originate within 50 km radius of Aranmula. Around 40 per cent of Kerala’s air traffic hails from the airport influence zone, he said. The project witnessed delays due to a case filed against it in the National Green Tribunal. This was, however, dismissed by the Tribunal. The company also had to wait for transfer of 52 acres of land from the State Government. George said with all the hurdles cleared, the company now plans to start work on the runway. The airport is designed to cater to aircraft such as Airbus A-320 and Boeing 747. The terminal building can handle nearly 1,000 passengers at a time, he said. Indian Oil is likely to set up a fuel farm at the airport, he said. NEW DELHI: The government has proposed to build 17 new airports in 11 states, an expansion plan that will partly address the Indian aviation sector’s growing capacity challenges and improve air connectivity in under-penetrated states such as Arunachal Pradesh, Jharkhand and Rajasthan. Minister of State for Civil Aviation KC Venugopal informed Rajya Sabha on Tuesday that the airports have been proposed for construction during the 12th Five Year Plan. Karnataka is the biggest beneficiary of the government proposal with as many as four airports to come up in Gulbarga, Bijapur, Hassan and Shimoga. Goa will get a second airport in Mopa and Kerala a fourth in Aranmula. Airports for Arunachal Pradesh, Rajasthan and Jharkhand will be built in Itanagar, Kishangarh and Deoghar. The expansion, though significant, pales in comparison with China’s. The head of that country’s aviation watchdog said last year that as many as 70 new airports will be built by 2015. Revenue minister AdoorPrakash has reiterated that the Aranmula airport project was aimed at the development of Pathanamthitta district and nearby villages. He told a news conference that a majority of MLAs [Member of Legislative Assembly] who oppose the project now had taken initiative for the airport five years ago. “They are the people who colluded for filling 250 acres for the project. This itself shows that those who protest now have clear vested interests. Also, it has to be remembered that the protest was even stronger during the time of Nedumbassery airport construction, which later went on to change the face of the nearby villages and Kochi,” he said. Prakash said the government had not taken any decision to acquire additional land for the project. “Acquisition of land is the sole responsibility of the company involved in airport construction. At the same time, the government will demand market value for the land owned by the state and acquired for the project during the LDF rule,” he said. The minister alleged that people who protest against the project are not residents of Aranmula or even Pathanamthitta. “A majority of residents are supporting the project,” he claimed. THIRUVANANTHAPURAM: Despite the opposition from the 72 MLAs [Member of Legislative Assembly] including the UDFMLAs for Aranmula airport project, the government is determined to go ahead with it. The government is considering an application from the KGS Group seeking an exemption for the 200 hectares of land that it had acquired for the project. Sources said it is gearing up to go ahead with the project and has taken stock of the court cases in connection with the project. The state government has the discretionary power to provide necessary exemption for the project both in terms of exemption from the purview of land reforms act as well as from the ambit of the wetland and paddy land conservation act 2008, according to government sources. The state government would provide necessary exemption if at all the application will be rejected at the lower level. A meeting was convened by chief minister Oommen Chandy, which was attended by chief secretary E K Bharat Bhushan, revenue secretary T J Mathew and land revenue commissioner M C Mohandas, in order to take stock of the situation. Meanwhile, the state land board is awaiting the disposal of the case relating to the takeover of the excess land, from the Kerala high court. The land board had declared 136 hectares of land owned by Abraham Kalamannil, from whom the KGS Group had purchased the land, as excess and had initiated the process of taking over the land. However, only 82 hectares out of this land could be taken over, and the high court had stayed the proceedings. Now that the matter is pending before the court, any decision can be taken only after the disposal of the matter by the court, where the petitions submitted by Abraham Kalamannil as well as the KGS Group are pending, said the state land board sources. THIRUVANANTHAPURAM: A cross section of socio-political and cultural leaders, including six MLAs from the ruling front, here on Saturday sought Prime Minister Manmohan Singh’s intervention against the controversial Aranmula Airport project here. In a memorandum sent to PM by post, around 2000 signatories pointed out several reasons that prompted them to come out against the airport project to which the state government has extended all support. Of the 72 MLAs who joined the drive, six were from the ruling UDF combine. They are V D Satheesan, T N Prathapan, Ahmed Kabeer, Palode Ravi, C P Mohammed and M V Sreyams Kumar. Writers M T Vasudevan Nair, ONV Kurup, justice V R Krishnayyar and film maker Adoor Gopalakrishnan were among the other prominent personalities who signed in the petition. Poet and environmental activist Sugathakumari, CPI leader and MLA Mullakara Rathnakaran, BJP state president V Muralidharan,StatePresident of BJP and Aranmula Heritage protection Committee chairman Kummanam Rajasekharan led a people’s march to the Aranmula Post Office, on Saturday, and formally sent the petition to the Prime Minister, with copies to Congress president Sonia Gandhi, Union minister forEnvironment and Forest Jayanthi Natarajan and Defence minister A K Antony. Addressing the march, Sugathakumari said the project would be opposed at any cost. The petition highlighted the alleged gross violations carried out by the proponents of the project as well as the state government, and demanded that the central government should reject environment clearance to the controversial project. “The proposed airport aims at taking into possession wetlands, paddy fields, flood plains of the holy river Pampa and the levelling of the neighbouring hillocks. An eco-system including natural age-old hydrological system would be destroyed, and even the immediate cost in human suffering would be invaluable. It is justice to nature that is being violated, and justice to people that is trivialized”, the memorandum said. “This project has no moral, scientific or legal grounds for its existence. It is impractical, anti-people, and would cause irreversible damage to the environment. In consideration of such realities, we humbly request that the environment clearance for the Aaranmula Airport Project be rejected, and that your excellency would kindly instruct the Government of Kerala to totally drop this project”, said the memorandum. PATHANAMTHITTA: People from different walks of life, including 72 legislators, some from the ruling Congress-led UDF, today signed a mass petition urging Prime Minister Manmohan Singh to withdraw central approval for the private greenfield airport at Aranmula in the district on the ground that it posed a threat to the environment. The MLAs, who signed the petition included AICC secretary V D Satheesan, M V Shreyams Kumar (SJD) and T N Prathapan (Cong), known as “green” legislators. One of the MLAs, C P Muhammad (Cong) later clarified that he did not sign the memorandum though he shared the concern of his colleagues over the ecological threat posed by the proposed airport, being developed by an investors’ consortium KGS Group. The project has acquired most of the central clearances and enjoys backing of the UDF Government, which has also a nominal stake of 10 per cent in the venture. A local resistance group called Aranmula Heritage Protection Council, which has the support of various political parties and cultural outfits, has been campaigning against the project arguing that vast stretches of paddy fields will be lost if it is allowed, causing serious environmental problems. The promoters of the project, however, rejected this contention holding that much of the land acquired for the airport has been lying fallow for decades. They have justified the need for the airport on the ground that area has hundreds of NRIs working in various parts of the world and is also close to Sabarimala temple, which attracts devotees from all over the country and abroad. The petition was sent by registered post by campaigners in the presence of the leaders of the movement, including poet and environmental campaigner Sughathakumari, after converging near the famous Aranmula Parthasarathi temple on the banks of the river Pampa. A copy of the petition has also been forwarded to UPA Chairperson Sonia Gandhi, they said. Thiruvananthapuram: Construction work for a proposed airport at Aranmula in Pathanamthitta district by a private group has run into trouble with the local Village Action Council announcing that it would disrupt any such work. Aranmula, which had been declared as a heritage village by the Centre and United Nations Development Programme, would cease to exist if the project came up, The Aranmula Heritage Village Action Council patron Kummanam Rajasekharan said. He claimed that the plan of the KGS group, promoters of the private airport project, was to develop an aerotropolis centring the airport for which at least 3,000 acres would be required. “This will not be allowed by people of Aranmula. We will disrupt the construction work if it is started this month as announced by KGS group,” Rajasekharan said, adding the construction would sound the death-knell for the culture and heritage of the ancient village. He alleged the state government had acted in haste to accord sanction to the project. As per an RTI reply the Council had received, the Centre had not yet given ‘in-principle’ approval to the airport project. No environmental impact study was conducted by any government agency and the objections raised by Assembly committee on environment was overlooked, he said. The reports prepared by the company’s own consultants were taken as the final word, he alleged. Rajasekharan said the people had no other way but to resort to a confrontationist approach if the work starts this month. All those opposed to the project would be brought together and a meeting would soon be convened to chalk out future course of action. Any construction work would be disrupted with the support of all parties against the ‘anti-people’ project, he added. He challenged Chief Minister Oommen Chandy to reveal the clearance obtained by the KGS company from the Centre and announce the area of land demarcated for the project. The state government had last week given sanction for the project and decided to hold 10 per cent shares in the company to be formed for the airport. Aranmula, Kerala: As protests against the setting up of a private airport at Aranmula in Kerala’s Pathanamthitta district go on, promoters of the greenfield project have dismissed the allegation of land grab and said vested interests are behind the controversy. Since last week, people living around the site of Kerala’s fifth airport are protesting against a notification issued by the state industries department declaring 500 acres of land spread across the Mallappuzhasserry, Kidangannur and Aranmula villages as an industrial area. The promoters, Chennai-based KGS Group, have acquired 350 acres and are looking for some more. The protesters are demanding that the government cancel the notification in the larger interests of protecting hundreds of villagers. “We are demanding transparency, especially in the land transactions. They claim that they have purchased 350 acres of land, which we have found out is not true. The villagers are also surprised to know that the previous Left government had notified 500 acres of land near here as an industrial area. People are against eviction and that is what the villagers are up in arms against,” said CPI (M) legislator A Padmakumar, who is leading the protesters. But Gigi George of KGS said it was absolutely baseless to say that the group went ahead with the project without having land in the airport’s name. “The truth of the matter is that 350 acres of land have been registered in the name of KGS Aranmula Greenfield Airport. The only thing that has not happened is that the mutation of the land that has been registered has not taken place. The district collector has given direction to the Revenue Department last month to complete the mutation,” George said over telephone from Chennai. The KGS Group has also pointed out that even though the 500 acres have been notified as an industrial area only industries connected with the airport would come up in the area. “There will not be any eviction or compulsory acquisition or displacement of any houses, commercial areas or worship places,” said the group in a press release. The airport at Aranmula is billed as a boon to Pathanamthitta, Kottayam, Idukki and some parts of Alappuzha districts, which together receive around 21 per cent of foreign tourists and 14 per cent domestic tourists who come to the state. Padmakumar said villagers were not against development and they just wanted transparency in the land deal. Thiruvananthapuram: KGS Aranmula International Airport Ltd, which is developing India’s first private airport at Aranmula, Pathanamthitta district, has received clearance for the project from the Airports Authority of India (AAI), according to the executive director of the developer. “A team from the AAI visited the site of the airport and gave full clearance for the project. TheRs.2,000-crore airport project is expected to offer a significant development boost not only to Aranmula and Pathanamthitta district, but also to the entire region,” said P.T. Nandakumar, Executive Director of KGS. This airport, once complete, will facilitate the pilgrimage to the Sabarimala temple, as the airport will come up near the temple. A statement from the developer on Wednesday said recent reports of protests against the airport were based on rumours. “There was a local shutdown to protest the inclusion of KGS Aranmula Airport project in the recent Emerging Kerala meet. The project was not included in the Emerging Kerala investment meet,” the statement said. Mr Nandakumar said that the KGS Group was committed to preserving Aranmula, which has been identified as a heritage village by the United Nations Development Programme (UNDP) for the implementation of the Endogenous Tourism Project. “The airport project does not involve displacement of families. Land for the project has already been acquired. Fears on these grounds are completely unfounded,” said Mr Nandakumar. Posted: Friday, September 20th, 2013. Filed in General News, Recent News.